Pictured as: the Wanderer (Puget Sound Tugboat Company) Photo by: P.S.M.H.S. Built in 1890, by the Hall Brothers Company of Port Blakely, Washington as the Wanderer for the Port Blakely Mill Company of Port Blakely, Washington. In 1891, the Port Blakely Mill Company entered a partnership to provide tugboat service in the Puget Sound region. 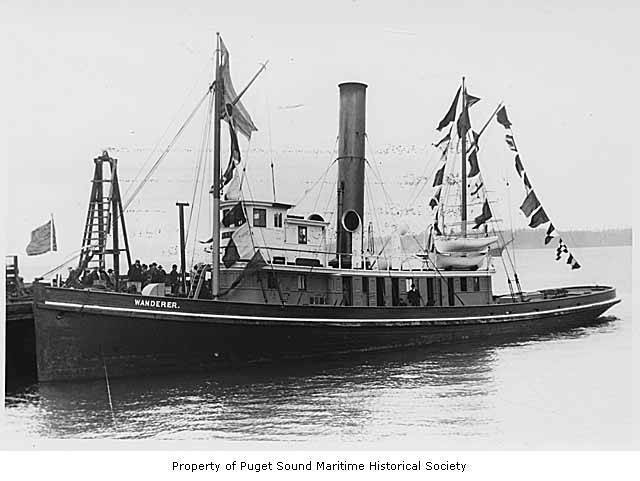 And provided the tug as a part of creating the Puget Sound Tugboat Company of Port Townsend, Washington. Where the tug retained her name. In 1918, the tug was acquired by the Merrill and Ring Lumber Company of Pysht, Washington. Where she retained her name. 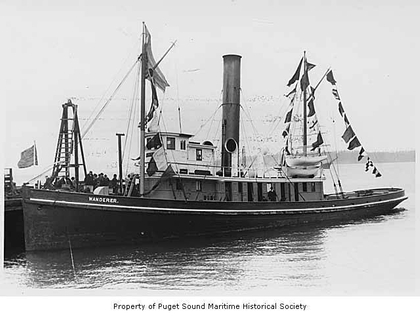 In 1936, she was acquired by the Foss Launch and Tug Company of Tacoma, Washington. Where the tug retained her name. In February of 1947, the tug ran aground near Double Bluff on Whidbey Island in Washington state. Where she was stripped, and scuttled near the mouth of the Nisqually River to form a breakwater. Port Blakely Mill Co., Puget Sound Tugboat Co., Merrill and Ring Lumber Co., Foss Tug and Launch Co.